Photo (3.75 x 5.5 inches) mounted to a cardboard frame/backing (a bit less than 6.75 x 9.75 inches; I’ve cropped most of the distractingly damaged backing from this scan). Photographer is A. W. Moore of Vandergrift, Pennsylvania. Otherwise undated and unidentified. Vandergrift is another one of those small towns that is disproportionately represented in my collection because a bunch of photos from there happened to come in a single online purchase. Although this is one of three photos of the man on the right, they seem mostly to be unrelated, and are mostly decades newer. But since this is the first one I’ve posted, I’d never looked up the town until now. It turns out to be almost as interesting as any of the photos! Established in 1895 about forty miles east of Pittsburgh, it was founded by a steel magnate (George McMurtry of Apollo Iron & Steel Co.) who had been so beleaguered by labor strife that he decided to earn (or buy, depending on your point of view) the loyalty of his workforce by creating an ideal planned company town. Apparently the entire town was created (steel mill erected, utilities installed, churches built, etc.) before a single resident moved in. And apparently it was a success. Who, you might ask, was the designer of such an audacious plan? Why none other than the design firm of Frederick Law Olmsted, the renowned landscape architect famous for everything from New York City’s Central Park to the 1893 Chicago World’s Fair! Incidentally, since the town was founded in 1895, we can date the photo to later than that (which I would have done anyway), and a picture of the photographer’s studio can be seen here. Good stuff Matt. 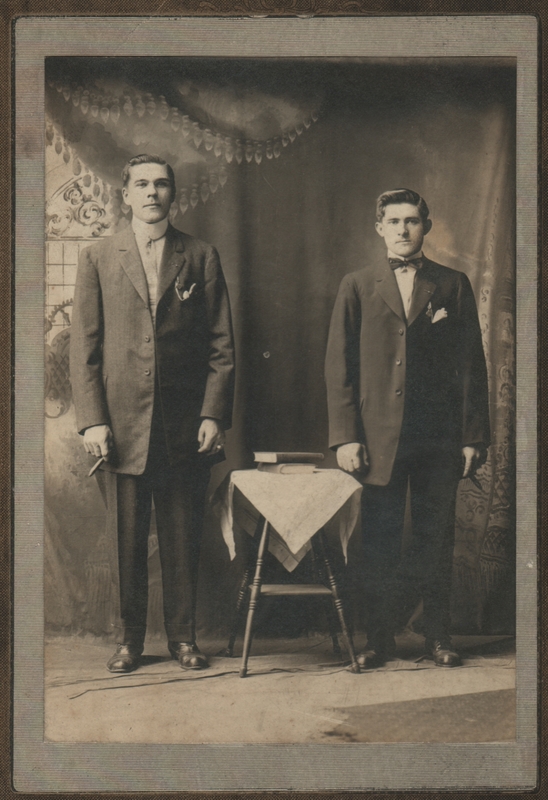 These are two interesting looking guys, both holding cigars, and I find the guy on the right to be somewhat menacing. Like he would bite your nose off if you look at him wrong. Truly a ‘you talking to me’ kind of expression. This is for sure one your more engaging photos. I’d never seen the watch-in-breast-pocket, chain-hooked-to-boutonnière-hole thing before. I don’t recall it either. Of course, it’s possible they didn’t know what they were doing. A must-have accessory for the discriminating gentleman. It’s interesting to get the different perspectives of a single photo. Would love to see a softer side of the gentleman on the right. I got “roughneck” at first glance. Loved the book on Vandergrift’s history! I’ll have to post another picture of him soon. I’ll also have to take a closer look at that book. I assembled the information about Vandergrift, and only then did I discover the book when I searched on the name of the photographer. It’s amazing how many resources are out there. Did you know Olmstead was consulted about the creation of Golden Gate Park? He recommended against it: too foggy and distant from the city as it was then. No, I didn’t know that about him. It makes sense though. The old maps and things from that time show it was a remote and inhospitable area, as you say. I’ve heard that the park was largely developed on old sand dunes, which was quite a challenge.